The first time I saw Samsung’s folding phone—the first time I held it—I couldn’t unsee the beds. It struck me as the smartphone version of two twin hotel beds pushed together to make a queen, with the suggestion of a seam visible under the comforter. But unlike a bed, designed for sleeping, the Samsung Galaxy Fold exists to occupy almost every waking moment of your life in front of screens. Certain people of a certain age will recall a time when “folding phone” meant you snapped your little flip phone shut at the end of calls, back when we used our phones to make calls. But a fold is different from a flip. The Galaxy Fold has a display that actually bends. Starting with what looks like a thicker-than-average smartphone with a touchscreen, you crack it open like a book, and a larger second screen unfolds. Seeing it in action feels like a high-concept special effect: both stunningly cheesy and a brilliant hack on the laws of physics. That foldability is supposed to make it more versatile. It can be both your everyday phone for texting and Twittering, and your tablet for Netflix and longreads. The long-awaited device goes on sale April 26, and it’s remarkable because it is one of the first foldable phones you can get in your hypebeast hands. It’s not the first folding phone. Concepts have been floating around for years. FlexPai, a flexible phone made by a Chinese company called Royole Corporation, started shipping late last year. But this foldable is made by Samsung, the world’s top-selling smartphone maker. The Galaxy Fold is a device that demands attention. This is not a drill. My first encounter with the phone happened the day before Samsung’s Unpacked event in February. I met with some Samsung executives in a hotel suite in San Francisco. DJ Koh, the president and chief executive of Samsung’s mobile division, was giddy about the phone. He told me he’s been using his pre-release Galaxy Fold regularly while exercising. Justin Denison, a senior vice president at Samsung (who has since left the company), seemed nervous about taking his Fold out of his suit jacket, never mind taking it out of the room. It was enthralling to see the device up close that first time. I went back and listened to my voice recordings from that day, and after my inaugural fold I said “Whooaaaaa,” like a nerd. As soon as folded and unfolded it, I wanted one, but I’m not quite sure why. I am sure, however, that I won’t spend $1,980 on it. That’s how much the Galaxy Fold costs. Koh’s positioning of the device is straightforward. “Why do people like luxury jewelry? Or any good, brilliant product? Once somebody makes it, people want to own it.” Based on that kind of immeasurable desirability, price is decided, Koh said. That messaging explicitly paints the Fold as a luxury device. That’s a variation on the messaging around the flagship phones from Samsung—or Apple—where great pains are taken to convince regular consumers they should spend $1,100 on an everyday smartphone with a neural engine and a triple-lens camera. With the Fold, Samsung is acknowledging that this thing isn’t for everyone. And they’re right. Just last week, I was able to play around with the Galaxy Fold again for a few hours, and I’m still certain I won’t buy this first-generation product. But to focus on its purchasability is to miss the point of what it is—and anyway, this isn’t a formal review. Samsung has made a folding phone it says will fold over 200,000 times before it shows signs of degradation (a claim that could take months or years to verify). In order to do that, it had come up with a display that could fold over on top of itself. It had to figure out what to do about the battery. It literally had to develop a spine. And then there are the apps, the ones that will need to work as well on a large 7.3-inch screen as they do on a 4.6-inch screen. Unfolding the Galaxy Fold is the whoa-worthy part. This is when it transforms into a 7.3-inch mini tablet. When you unfold it, it makes a sound that’s not quite a click. It’s like hearing a door creak underwater, or listening for an arthritic joint in your own body. It’s addictive. Closing the phone again produces more of a definitive snap. Back to the open, 7.3-inch Galaxy Fold: I can hold it in one hand, though I probably wouldn’t want to for an extended period of time. The display has a 4.2 by 3 aspect ratio, and the image appears bright and rich-looking. You can see the center crease when you hold it at certain angles, the slightest ripple in a still pool of water. The Fold has what Samsung calls a Dynamic AMOLED display, the same display that’s in the Galaxy S10 phones. It’s the composite polymer and malleable adhesive that Samsung is most secretive about. It’s what holds together that AMOLED display, a conductive polymer layer for touch (the digitizer), and a scratch-resistant layer for protection, all in a foldable format. The screen can’t be glass; glass is too rigid and not flexible enough, at least not yet. Samsung is particularly proud of the hinge it designed for the Galaxy Fold. It’s squeezed into a space about four millimeters wide, and built with three different gear modules. One in particular, a half-moon module with interlocking teeth, is what prevents the phone from bending backwards. You can open the Galaxy Fold to a flat 180 degrees, but it’s not built to go beyond that. This is unlike Huawei’s upcoming Mate X, which folds in the opposite direction, so that when it’s closed you have two nearly edge-to-edge displays on front and back. There are other elements of a standard smartphone design Samsung had to reconsider. “People think it’s just about the display, but there are a lot of challenges that go into this form factor,” Paul Guzek, a senior manager of product marketing at Samsung, told me. Its 4,380 mAh battery is split into two, with one piece on each side of the hinge. It has a constellation of no fewer than six camera lenses, so that you can use it as a camera no matter which configuration you’re in. Its cellular antennae couldn’t just run clean along the side of the phone. In this case, the antennae also cross the body of the device, running through the hinge from one side to the next. I realized after Samsung had taken the phone away again that I never made a phone call on it. One of the most crucial elements of the Galaxy Fold’s utility is app support. Samsung is introducing (yet another) new Android experience, and as with all of the various-sized Android devices out there in the world, that means developers will have to tweak their apps to fit it. My app experience was limited in the short time I used it. But I was able to play around with what Samsung is calling “app continuity.” This is the ability to launch certain apps on the “small screen,” and then unfold the phone and watch the app auto-magically expand to full size on the larger screen. It works particularly well with Google apps, like Mail, Chrome, Calendar, and Maps, since Samsung partnered with Google to make sure some of Android’s key productivity apps were Fold-ready. The Galaxy Fold also supports multiple app windows on the 7.3-inch display. Samsung insists this won’t be distracting at all, and that for things like running a gaming app and a chat app side-by-side, it could stay help you focused. That claim sounds about as plausible as climate change really being a hoax, but the fact is, you can run up to three apps at a time. This worked for some of the apps I tested, like Chrome, Facebook, and Mail. Netflix, though, clearly wants to own your eyes. The Netflix app itself is optimized for the Fold, but when you try to open another app alongside Netflix, it opens directly in the middle of the screen. Watching videos is one of the prime examples of what the Galaxy Fold might be good for. So is reading. When the Galaxy Fold is unfolded it is nearly the size of an iPad Mini, which is a great media consumption device. Sure, our phones are great at that stuff too, especially the larger-screened ones. 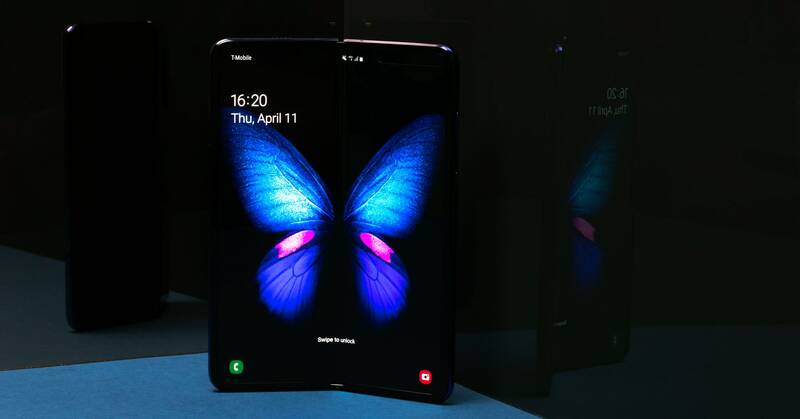 But as someone who spends a lot of time on trains and planes, I’m absolutely intrigued by the notion that a Galaxy Fold, or something like it, could eliminate the tradeoff that exists right now: This or that? Big or small? There’s only so much room in the bags we carry with us. There’s only so much space in our lives. Then again, there’s only so much cash in our wallets.